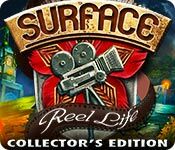 Surface: Reel Life Collector's Edition is rated 3.4 out of 5 by 52. Rated 5 out of 5 by Majestyx12 from I Love the throwback to Elephant Games with 2 different elephant items An old game complete with VCR tape and dustbuster. The graphics aren't great but a really fun game. A jungle theme out of a movie screen. 7 chapters + bonus. The Hops are different. You have to use things out of your inventory. There is a tong switch to go back and forth. Some times you don't have it in your inventory yet so you go and find it and come back to your hop. I loved the pin ball machine and other fun things to do. Had tiger, naughty monkey and bobbleheads. Your in CineCity, get it? Some same people and animals in the bonus. Ended Nice. Rated 5 out of 5 by mattiehelen2002 from Surface: Reel Life Collector's Edition Loved the graphics and storyline. The puzzles were great and involved a lot of logic, but it was entertaining and relaxing to play. I loved the interaction with the HOs. I have all the Surface series, but Reel Life left me hanging because I have no idea what achievements I missed other than the 160 flowers and not being able to see the final film. Unfortunately, I have been spoiled by another game and know it will require extra work, but you need an "extras" section so one can go back and replay puzzles and HOS, and discover what they missed! Other than the flowers, I have no idea what achievement I missed. Rated 5 out of 5 by FORTUNATUS from Get REEL reviewers! This is a GOOD game!!!!! I am disappointed with many of my fellow reviewers with their harsh and critical low-balling on this one. Yes it could be deemed a bit 'cheesy' in theme, yet it is supposed to be! AND in keeping with many Hollywood classics [seriously!? they are typically not 'deep' in plotline, either! ]* and SURFACE: REEL LIFE holds it's own in both theme and gameplay... eccentric, off-beat and imaginative gaming! *[I am a true classic movie buff.. from silent film to 30's/40's... absolutely the BEST] So, I am absolutely enjoying this VERY well designed game that offers great graphics and adventure HOG at it's best.... who can resist that silly monkey's face while he is eating the banana!@! SO adorable [and I am not usually 'taken' with cute/adorable, haha]. Give it a whirl and try to ignore the reviews... rate it on your level of gaming satisfaction... if you like adventuring... and light gaming with lots of imaginative exploring, you'll like SURFACE: REEL LIFE; it's not real [reel] life, but it's lots of reel [real] ENJOYMENT! : ) Happy gaming... have fun! 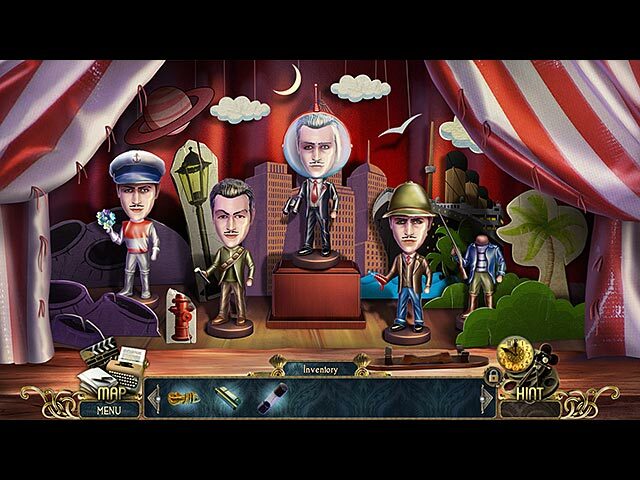 Rated 5 out of 5 by farmguys from Surface: Reel Life Collector's Edition I fell in love with this hidden object game immediately and was sorry to see it end. I love the Surface series and never pass them up when buying a hidden object game. Our family loves our Big Fish Game Club and we have been members for 6 years. Rated 5 out of 5 by pawsgame from Can't wait for the next Surface Game I haven't had this much fun with a game for awhile. Great story line, beautiful graphics and lots of fun games. Rated 5 out of 5 by Penhip from QUALITY GAMING FROM THE SURFACE TEAM! I'm frankly surprised by the negative reviews this game received. Technically, it has the same creative, innovative approach that is unique to The Surface series. The clarity of the HOS, the surreal storyline and great mini-games. The only significant departure from this game's typical production style is that it relies on animation cut scenes instead of actors, which I frankly enjoyed. Outside of Surface's The Soaring City, which was admittedly a wonderful production and The Noise She Couldn't Make, the use of actors was an appealing choice in relation to the storyline. But, as a fan of animation, The Reel Life, was a seamless transition for me. Paying homage to the birth of cinema and it's famous pairings like Mary Pickford and Douglas Fairbanks, I enjoyed the cinematic aspect of the storyline and the old film trailers that are shown by collecting the now famous Surface Flowers. I played the CE version of the game and it certainly has a different ending if you continue. It was fun, engaging and, the true test for me… I played the game straight through. Rated 5 out of 5 by bmn5772 from WINNER WINNER BIG FISH DINNER Thanks so much.....I had two game credits just waiting for the right game........THIS IS IT! Rated 5 out of 5 by pennmom36 from Just Keeps Getting Better And Better Mary and her daughter Jane are at the Deja View theater enjoying an oldie but goodie movie, they've seen it several times but this time it's different. They certainly don't remember spears missing the actor much less coming through the screen! Chaos ensues and the entire theater comes to jungle life, the plants and animals are literally leaping onto the stage and that's just the Surface folks, there's lot's more to come! Turns out that Mary and the star of this film, Andrew Light, were an item back in the day, that is until tragedy struck..........As usual in the Surface games there are hidden Wallflowers to collect and when you collect enough Wallflowers they can be used to view a bonus film, you need to collect 30/80/120 to view sections of the film. 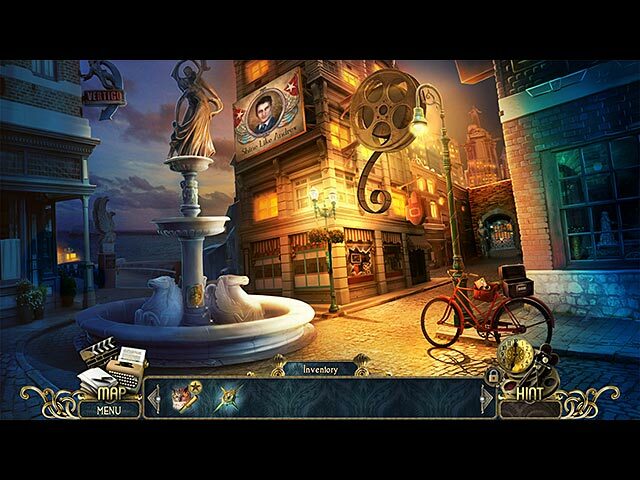 Another unique feature Surface games have is with the hidden object scenes. 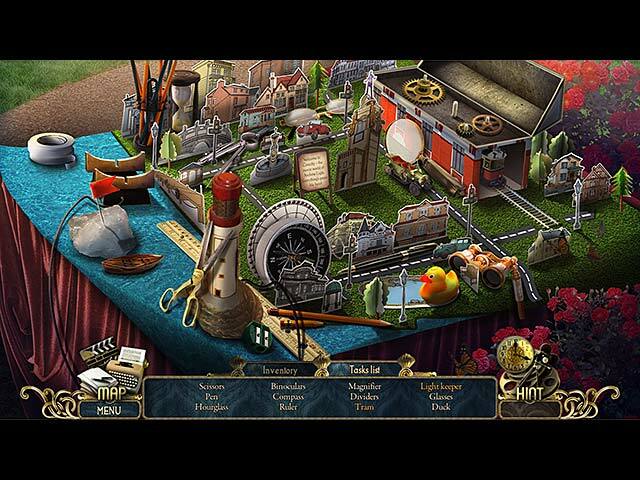 Some of the inventory items you collect will be used within the hidden object scene so don't forget to toggle back and forth between the inventory bar and the list bar. I absolutely loved the King Kong Pinball mini game! You had to adjust flippers to allow the pinball to ricochet off each other, you also had to adjust planes and flowers and even King Kongs arm, fantastic mini game, very entertaining. I know I have just skimmed the Surface on this game, it's definitely one of the top 10 games of the year so far, enjoy! Rated 5 out of 5 by JustTheFacts from Wonderful, But Not The Best Surface BASED ON DEMO FIRST IMPRESSIONS Not as impressed as I usually am by this low key intro to the fifth Surface game. The cut scene graphics are cartoony and very very rough, compared to the other aspects of the game. And the only thing surprising about the story is that it hasn’t been done more often. Every time I see a game title with anything related to the movies, I always expect it – the actor coming out of the screen. SIGHTS & SOUNDS Apart from the cut scenes, the graphics are excellent, although not, I would say, inspired. I much prefer the images of say, Pantheon – beautiful, imaginative, original. They are also strangely slow. At the end of a brief narrative bit, the ‘film’ will keep rolling even though nothing is really happening. I couldn’t figure out why. The sounds are good, and I feel a good deal better than their visual counterparts. The music and sound effects are very fitting and realistic, and the voiceovers are well done. WHAT’S HAPPENING? Your sister and niece go to the cinema to see your niece’s late fiancé in his last film, made some 10 years ago. Something shocking happens, though, the fiancé steps right out of the screen and grabs your niece, dragging her reluctantly back into the film. In the meantime, the rest of the movie is busy relocating as well, and there are some pretty amazing creatures in this jungle epic. Once you save your aunt from a tiger, you realise to solve this dilemma you are going to have to enter that dangerous jungle world. Super Auntie to the rescue and it isn’t even a Grim Tales game! *wink* GAMEPLAY The gameplay is a fairly easy adventure with enough of both puzzles and HOPs to satisfy your desire for either. The puzzles so far have been relatively simple, familiar and prettily done. Again, nothing engagingly original, but enjoyable. The HOPs are strictly word list, with only one or two interactions, which are with inventory items, not in the scene. There are inventory items that require further additions or manipulations to be useful. The game has the usual range of up-to-date features. Three levels of difficulty, inventory lock, journal (with replayable videos), an odd-looking interactive map that indicates scenes with tasks and completed scenes. The hint system is also teleporting. There are 7 chapters, and the demo, which took me almost exactly an hour, covers the first two. CE BLING! For me, the most exciting bit of the game so far! We have of course a bonus chapter. The Strategy Guide is available in game as well as in the main menu. The gallery includes nicely done wallpapers (10), saveable concept art (10), music tracks (5), and a screensaver. There are a fair number of performance-based achievements, in their own display setting, 4 of which are related to the 160 collectible metal flowers. All of which are needed to gain access to the Secret Room. Which, if you have played any recent Elephant game, you will know is where you will find a game that is almost another game using the same puzzles and HOPs. I like to call it the ‘Readers Digest’ version of the game, and I love it! COMBINED IMPACT It’s a winner, despite the disappointing standard of the cut scenes. I can’t resist a jungle adventure, even if I could have held out against the bonus content. But I don’t think it stands up well against the last Surface game, The Pantheon.